Mill Creek Dental has recently added a new state of the art technology to our practice. We are excited to introduce and implement digital scanning to our practice. By using a comfortable scanning wand we are able to take full arch scans of our patients for patient education and records and also take full arch scan for night guards (no need to take molds of patient’s teeth which are often uncomfortable and especially difficult for those patients with a strong gag reflex). We are also able to eliminate impressions for crowns, bridges, and implants. The scans are able to capture the detail (if not more) of all of the information our labs need to fabricate beautiful, well-fitting restorations. And unlike in the past, if we need a little more information in the impression, it only take a few seconds to recapture the area versus taking another four minute impression! The Trios 3Shape is notable because it scans in color which captures tissue, teeth and restoration changes as well as shade of teeth to compare for bleaching and to send exact shade matches to our labs. The digital scans are sent seamlessly to our labs over the digital highway and are received within minutes of us finishing a patient’s scan. The labs use printed models to fabricate crowns, bridges, night guards and implant restorations. Both of Dr. Chin’s assistants are well-trained with the new technology and they can quickly and comfortably scan the necessary areas for the procedure being performed. Mill Creek Dental is very excited to add this technology to our practice and can’t wait for our patients to see and experience digital dentistry. Please feel free to ask us about our Trios 3Shape Scanner! Many dentists are moving towards using porcelain restorations exclusively. While porcelain is very strong, can bond directly to the tooth and is of course, most esthetic and natural looking-gold is another dental material that has many advantages. Gold is most often used on the posterior teeth, unlike amalgam (silver) fillings, gold will not oxidize and discolor teeth. In fact, gold is the most biocompatible material that can be used in the mouth. Gold has almost the same wear rate of natural tooth structure. The junction between gold and tooth are nearly imperceptible and this makes it far less likely to harbor plaque which contributes to better tissue health. Gold can be polished and finished to a higher degree than other materials, many people find the sensory acceptance of gold by the tongue and the feel of chewing is enhanced by the smoothness and anatomical replication of the missing tooth structure. 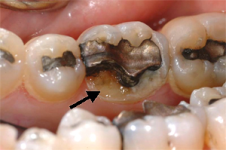 Well placed gold restorations will last much longer than other filling materials used today. While porcelain is a great dental restorative material, it does have a brittle factor which can chip and crack over time. At Mill Creek Dental we provide both porcelain and gold restorations. Dr. Chin is very proficient with both materials and is happy to discuss the pros and cons of both and which restoration may be most suitable for your particular tooth. Dr. Chin is a member of the Academy of R. V. Tucker Gold Study Club and likes to let her patients know that there are always different options for each individual and their particular restorative needs. Do you clench or grind? A night guard may be the answer. A child's introduction to professional dental care ideally should take place by their first birthday. The earlier you begin, the better chance there is to prevent problems. Most cavities in children start to develop before age three. A good time to schedule your child's first dental visit is in the morning, when he or she is rested and likely to be cooperative. If they enjoy the first dental visit, future ones will be anticipated rather than feared. Early experiences will influence their attitude toward dental care, and can help start them on the path to a lifetime of good dental health. What could be more beautiful to you as a parent than your child's smile? An early orthodontic screening assures that your child's smile will be healthy and look its best. Just as your child's first visit to the dentist should be as early as six months, the best time for a first visit to the orthodontist is by age seven. It may also help minimize the need for more extensive treatment at a later date, such as the removal of permanent teeth. Early treatment may also help your child's self-esteem - a fragile asset that's so important in growing up.